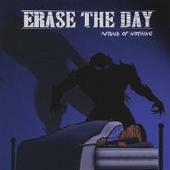 Erase the Day's "Afraid of Nothing" is modern metal in the vein of Disturbed, Korn and Godsmack. I'd almost call if nu-metal except that it isn't quite and, because that term alone can turn too many people away based solely on that phrase along. And Erase the Day deserve to be heard. So we'll go with "modern metal" here and the comparisons to Disturbed, Korn and Godsmack stand. Especially Disturbed. "Afraid of Nothing" is heavy with crushing guitar, hammering rhythms and a vocalist who can scream when he needs to and brings it down a notch when called for. As you might guess, Erase the Day is at their best when delivering the heavier goods, but their slower, more ballad-like songs aren't half bad either. Songwriting is solid throughout with the lyrical content delivering equal doses of rage, angst and even a dose of good old in-your-face inspiration. The production is crisp and through, especially for a self-released CD. Fans of the any of the three well-known bands mentioned above will find something to their liking on "Afraid of Nothing." It's a strong CD from a promising band and I look forward to hearing more from them in the future. Erase the Day: Lee Sammartino - drums; Eric Koonze - vocals; Jim Lewis - guitar; Kevin Boyd - bass. For more information, check out www.erasetheday.com.